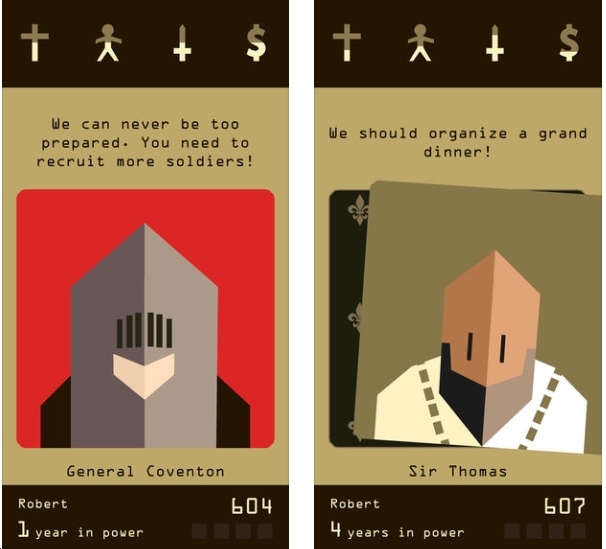 Reigns comes from Devolver Digital. 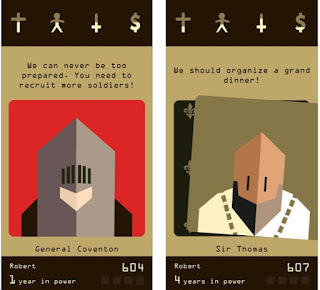 The App Store Editors have had it listed in their 'Games We Love' section for a while. Unquestionably, this is a weird game/puzzle. 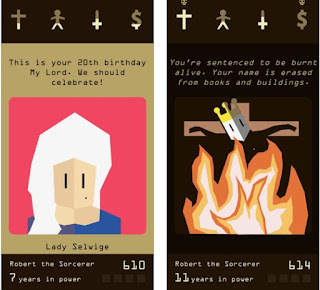 The object is to stay alive as long as possible by balancing the 4 powers at the top of each screen: the church, the people, your power, and your money. If any of these gets to zero or gets completely filled, your Reign is over. Cards are revealed one at a time. For each card, you have 2 choices. Sometimes they will affect 1, 2, 3, or even all 4 powers. Not always predictable. For example: is borrowing money at 5% good or bad for the kingdom's finances? On the leaderboard, there are over 900,000 players, which means the producers have made a boatload of money! Also, the top scorer has lived 666 years. My guess: that player has played this game a hundred times and recorded the outcome of each card TWICE (because there are 2 options for each card). Then played it to perfection. This is one game that may have actually consulted a History Major to incorporate all the weirdest scenarios that monarchs have faced over the centuries. Graphics: not very good. Consider the fact that there are so many artists who create their own Tarot Card decks with fantastic art.